On Aug. 1, President Donald Trump met with a group of Black pastors and Christian leaders at the White House. The meeting was reportedly meant to pray with the President and discuss critical topics among them urban workforce development, prison reform, and possible public-private partnerships with the faith community. 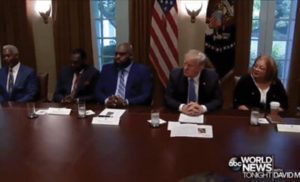 The roundtable event, dubbed the president’s “Meeting With Inner City Pastors,” was attended by a number of well-known African American church leaders among them Bishop Harry Jackson of Hope Christian Church in Beltsville, Maryland, Martin Luther King Jr.’s niece Alveda King, Ohio pastor Darrell Scott, and Alabama Pastor Kyle Searcy. This meeting has seemingly upset the African American community with Megachurch pastor John Gray receiving the great chunk of the criticisms. Before the beginning of the meeting, Trump praised those in attendance saying they were great people, most of whom he knew. “My administration is open, 100 percent, and we have been,” he said. After talking briefly about his administration’s accomplishments on things like manufacturing jobs and prison reform, Trump asked Gray to pray for the group. Gray was seated to the right of the president during the discussion and it is at this point that he decided to laud the president and his administration. “We pray that you will continue to give wisdom and insight to our president and his leadership team to be what our nation needs, to build this country from the inside out, that we will continue to be a beacon of hope and light around this world,” Gray said, according to CBN. After the prayers, Trump proceeded with the meeting and touched on the administration’s priority to help inmates be prepared to re-enter society, an initiative being led by Trump’s son-in-law and senior adviser Jared Kushner. Following this recent White House meeting, the African-American leaders have found themselves in the face of criticisms for their decision to meet with Trump. On Instagram Thursday, Gray responded to critics. He explained that he didn’t participate in the meeting to show support for the president. “My wife @grayceeme told me ‘If you go, no one will hear what you say. They won’t understand why you’re there. And any good that could come out of it will get lost in translation.’ Wise words from a loving, discerning wife. I had not one thing to gain by being there. Not. One,” Gray said. “But I asked the Lord when I was asked to be present in this initial meeting about potential prison reform-that could greatly end up benefiting many people who look just like me,” he added. “I myself have been vocal about my personal disagreements with key policy decisions of this administration. I have everything to lose. Credibility. Reputation. Every natural inclination says stay home. Don’t get played. It’s gonna be a photo op with no substance,” Gray added. Gray said he went to the meeting to listen and to pray for comprehensive prison reform, so people could have the second chance they need.